This iPod or iPhone 5 sleek E-Case with access to the headphone jack allowed me to experience complete functionality even when it was raining outside because of its waterproof protection. The waterproof SealLock zipper guarantees protection from all the elements. This e-case allows the phone to withstand for 30 minutes when it is submersed into 1 meter of water. The PVC free material used for this e-case offers superior cold weather pliability. The UV resistant urethane windows allow us to access the screen, and gives access to full touchscreen, camera and voice capabilities. Although, the Touch ID fingerprint sensor does not work through the case I did not find this problematic as I was able to just enter the pin code for the phone and use. The lash point lets us tether it easily to our apparel, backpack for security whatever adventure we undertake. I am sure this case will come in handy when we go on hikes, camping, snowshoeing, and more. I really like this super absorbent RobeTowl that is very soft and perfect to take with us when we travel, or to take with us when we go for fitness activities. 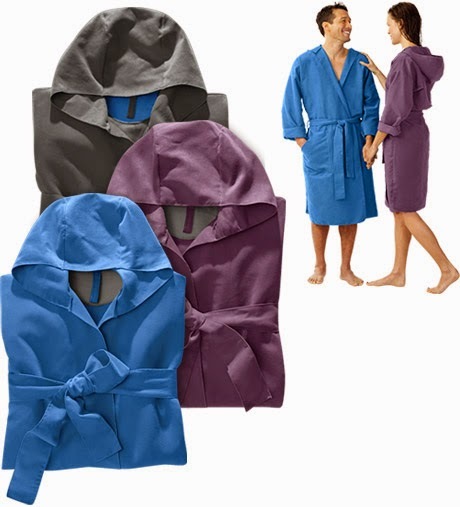 This multifunctional PackTowl product is both a robe and towel in one, and makes it easy to use for privacy and quick drying. The lightweight, compact RobeTowl comes with a netted bag. The best thing about this PackTowl is that we can easily wear, wring it, and reuse it. The towel is made with 85% polyester and 15% nylon towel. The towel absorbs four times its weight in water and dries quickly. I really like that it is antimicrobial, as it stay fresh longer so we do not have to worry about having a dry towel when we travel. The E-Case and the PackTowl are good investments, and are really useful for all types of adventures. What great, practical and innovative products! Thanks for the introduction! I wasn't aware of either of these travel products - thanx for your review of them. I might just check them out! I LOVE that Robe Towel!!! Everything sounds great and looks like a product I would like to try. Thanks for the great review which has enlightened me to these awesome and somewhat necessary products.I really like both of them. I am pleased to learn of both of these products.I think they are great and would like to get them for gifts for my daughter.Thank you for the great review. I love the Robe Towel. I think this would make a great gift! I love that phone case. I love to walk in the rain and often leave my phone home when I go. Something like this would be perfect for me. This is a great idea and would make a good stocking stuffer. We are going traveling soon, thanks for the helpful and awesome suggestions! I love that robe towel, perfect for travelling. Loving that e-case! I could totally use something like that, and had no idea it existed! Great products!! I think the waterproof case would be very useful in rainy Vancouver! I especially like the phone holder. A few years ago I fell outside and my phone got wet and would not work, so I could not call for help. It took me quite some time to get up and walk back home with an injured leg. If I would have had a holder like this there would not have been a problem with a non-working phone.